Thursday March 8th 1894 Will fixed a scaffold so I could paper the stairway. It was an awful job ad I did not get it done till nearly three oclock. Josie then put in the rest of the afternoon in the dining room closet and I put up hooks and cleaned up our closet down stairs and put our clothes in it. I was very tired. Will went to town in the afternoon. 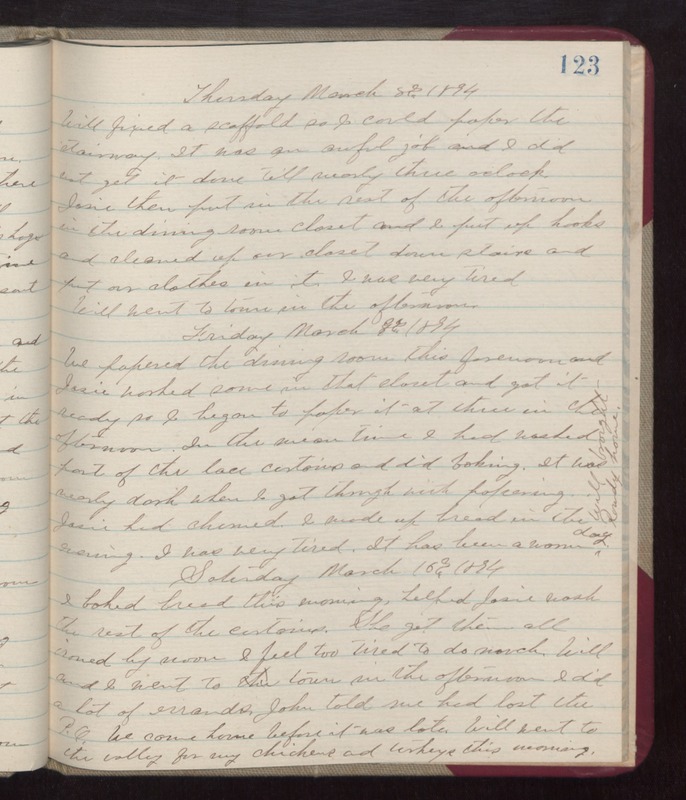 Friday March 9th 1894 We papered the dining room this forenoon and Josie worked some in that closet and got it ready so I began to paper it at three in the afternoon. In the mean time I had washed part of the lace curtains and did baking. It was nearly dark when I got through with papering. Josie had churned. I made up bread in the evening. I was very tired. It has been a warm day. Will brought Randy home Saturday March 10th 1894 I baked bread this morning, helped Josie wash the rest of the curtains. She got them all ironed by noon. I feel too tired to do much. Will and I went to town in the afternoon. I did a lot of errands. John told me had lost the P.O. We come home before it was late. Will went to the valley for my chickens and turkeys this morning.